Motorized Swimming Duck Decoys are defined as electrically propelled decoy devices that are used to mimic real ducks swimming on the water. Their drive systems can either be propeller, water jet, spinning paddles, line driven, or even magnets. There are many versions including those that swim in circles, back and forth, and dunk/dive. 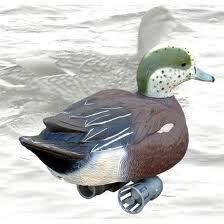 Most motorized swimming duck decoys can either be operated with an on/off, intermittent, or remote control switch. Their power sources are usually replaceable, AA, C, or D size batteries or rechargeable, 6V or 12V lead-acid sealed, on board batteries, or rechargeable/deep cycle marine or automotive, 6V or 12V, wire connected batteries. I have used swimming duck decoys for the last 20 years. They are a big benefit on those no or low wind days as they add realistic movement and wave motion to my entire spread. I use them in most conditions to simulate ducks dabbling or swimming in my spread. I also use them in combination with spinning wing decoys, shakers or "quiverers", flapping wing decoys, "splashers", and full body decoys giving my spread an enticing, realistic look. Depending on the weather, wind, and location, I will position the swimming decoys within gun range throughout my decoy spread. Using swimming duck decoys, in any state that allows them, can help you reach your daily bag limit. 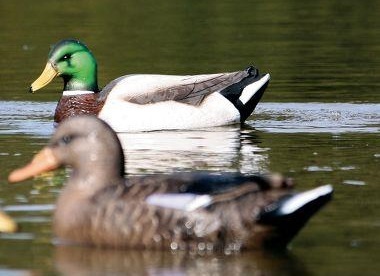 You should check the regulations in the state you intend to use swimming duck decoys.